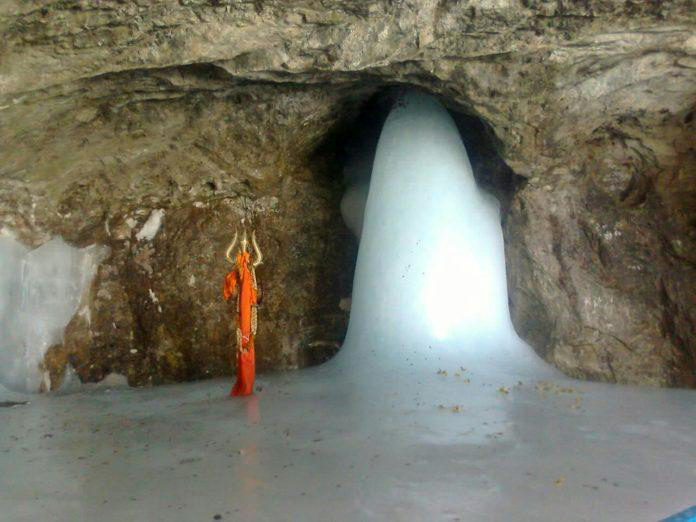 During the month of Shravan (July-August), tens of thousands of Hindus undertake an arduous 50km pilgrimage through the scenic Himalayas to worship a very special symbol of Lord Shiva: an ice stalagmite-lingam that forms each year in the cave of Amarnath at the end of the Lidder Valley in Kashmir. 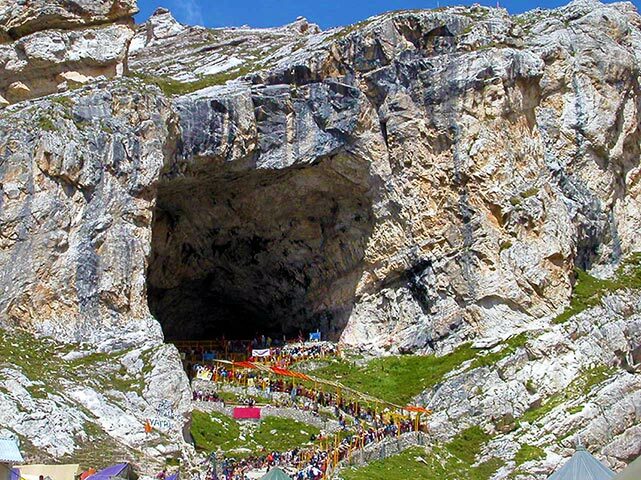 The sacred Amarnath cave is regarded as one of the principal Hindu pilgrimages or yatra. The ice lingam is believed to grow and shrink according to the phases of the moon and is largest in summer. It is flanked by two small ice-lingams said to represent Shiva’s consort Parvati and his son Ganesha. The cave is open to pilgrims during the short two-month summer period when it is accessible; the rest of the year it is buried in snow. Although the sacred cave is already mentioned in the ancient Purana manuscripts, according to folk legend it was discovered by a Muslim shepherd called Buta Malik in the 15th century. The story goes that a holy man gave Buta Malik a bag of charcoal to heat his home. When he got home, the shepherd found to his amazement that the bag was full of gold coins. Overcome with joy, he rushed back to thank the saint but could find no trace of him. Instead, he discovered the sacred cave and the ice lingam. He told the villagers of his discovery and pilgrims have been coming to the cave ever since. According to another legend, Shiva chose this secluded cave as the place where he would reveal the secret of immortality and the creation of the universe to his consort Parvati. Once upon a time, Parvati asked her husband Shiva to explain why he wore a necklace of skulls (mund mala). Shiva replied, “Each time you are reborn, I add a skull bead to my necklace.” Parvati said, “My body dies over and over again, but you are immortal. How can this be?” Shiva said it was due to Amar Katha, the secret of immortality. 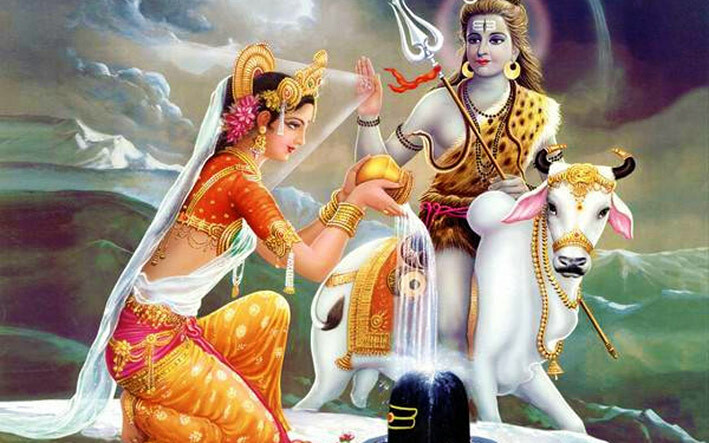 Parvati’s perseverance persuaded Shiva to reveal the secret of immortality to her. He chose an isolated spot where no human could overhear them: Amarnath cave. On his way to the cave, Shiva left his mount, the bull Nandi, at Pahalgam (Bail Gaon). That is why the pilgrimage starts at Pahalgam. Then he took the moon out of his dreadlocks (jataon) and left it at Chandanwari. On the banks of Lake Sheshnag he released the snake he wore around his neck. He left his son Ganesha at Mahagunas Parvat (Mahaganesh Hill) and finally he left the five elements, Earth, Water, Air, Fire and Sky, behind him. Having relieved himself of all that, he went into the holy cave of Amarnath with Parvati. Lord Shiva then sat down and entered samadhi (deep meditation). To make sure no living being could overhear the secret of immortality, he created Rudra, also called Kalagni, and told him to destroy every living thing in and around the cave by fire. Then he began to reveal the secret of immortality (amar katha) to his consort. But it so happened that the fire had spared an egg that was lying under the deer skin. A pair of doves hatched from the egg and, hearing the secret of immortality, became immortal. It’s said that the doves that can be seen around the cave today are the same two doves born of that egg long ago. 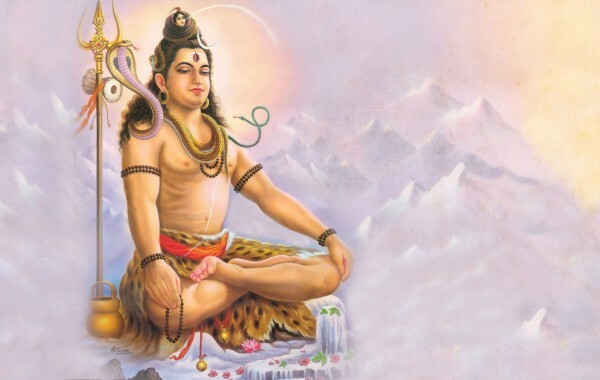 Shiva then announced that whoever visited Amarnath cave would attain moksha, freedom from the cycle of birth and death. A permit is required to perform this fascinating pilgrimage. To obtain it, you have to undergo a blood test, lung scan and cardiovascular check-up in an approved Indian hospital and register with one of the banks listed by the yatra organisation. The altitude, steep climbs and changeable weather conditions can be a tough test of your fitness. 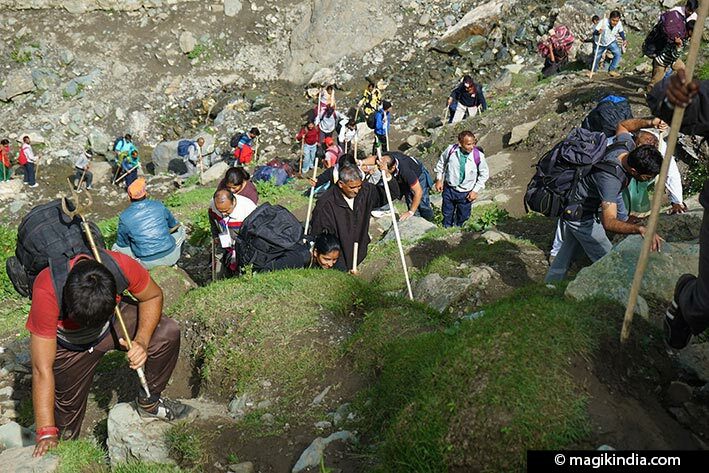 Although the pilgrimage poses no particular problem for sports practitioners apart from having to slow down in the oxygen-thin air, other people are strongly recommended to undertake some physical training before starting the yatra. These recommendations should not be taken lightly. Mountains can be unpredictable. It is best to make sure you are in top form before starting this holy trek. The permit comes in three parts which you give to the authorities on the way. Among other items they mention your name, address and the pilgrimage starting point you have chosen. NB: you cannot change these data after you have registered with the bank. If you lose your permit or want to change the date, for example, you have to repeat the entire administrative process including the medical check-up. 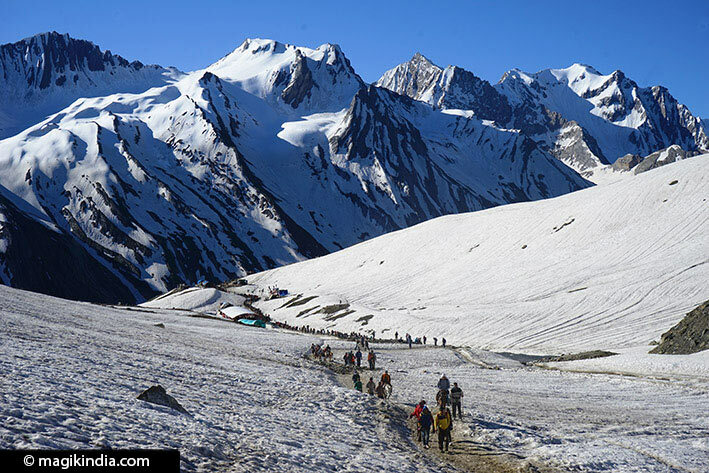 You can perform the Amarnath pilgrimage on foot, on horseback or even by helicopter from the town of Baltal. 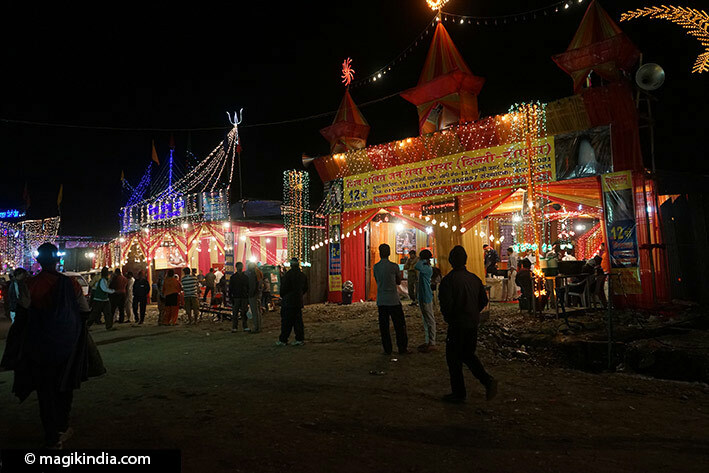 In the old days the pilgrimage started at Srinagar, 90km away, but these days most people start at Chandanwari, 16km from Pahalgam. From there it’s a 43km walk or ride: 23km to the sacred cave and 14km from there to Baltal, your end point. Some people start from Baltal and just do 14km to the cave. 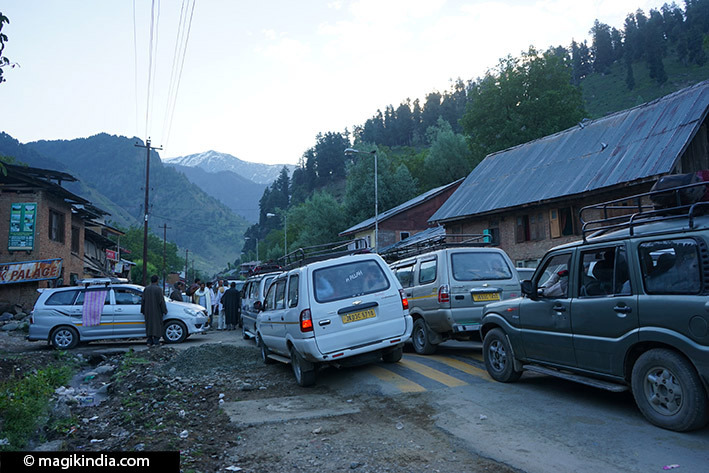 Others do the yatra in reverse from Baltal to Pahalgam. 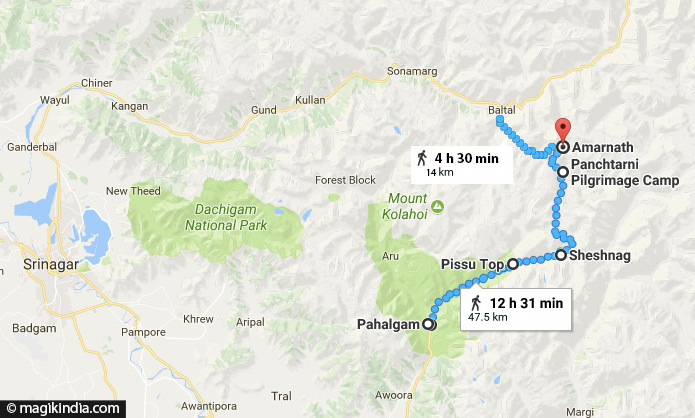 It takes two to five days to walk from Pahalgam to Baltal depending how fit you are. 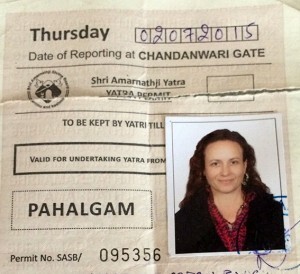 The day begins at 6am with a taxi ride from Pahalgam to Chandanwari. A long queue forms as the security forces carefully check each car. A long queue forms as the security forces carefully check each car. Two hours later, in Chandanwari, the trek begins at last. It’s tough going for the first dozen kilometres or more. The scenery is breathtaking and the group’s energy draws you on in spite of yourself, towards Pissu Top. The track follows the Lidder River and then climbs steeply to Pissu Top. There is a story that the Devas (deities) and Rakshas (demons) fought a battle, each wanting to arrive first for a darshan of Shiva. With Shiva’s help the Devas won; they killed so many Rakshas that the pile of bodies formed Pissu Top. 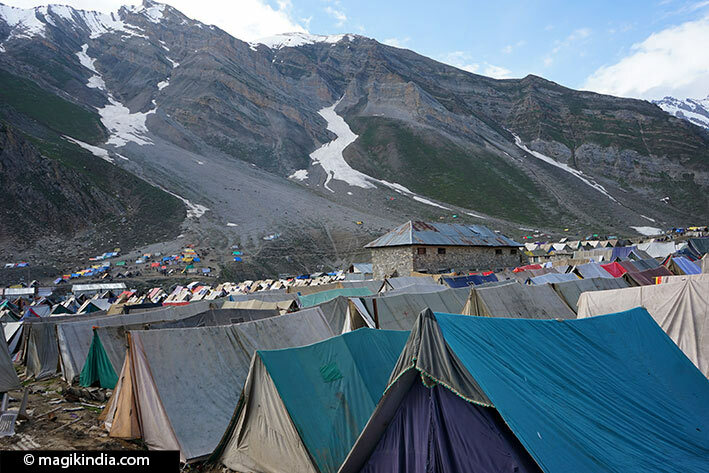 Twelve kilometres from Chandanwari you reach Sheshnag base camp where you spend the night in well-appointed tents rented out by Kashmiris. Free meals are served by Hindu non-profit organisations called bhandare. 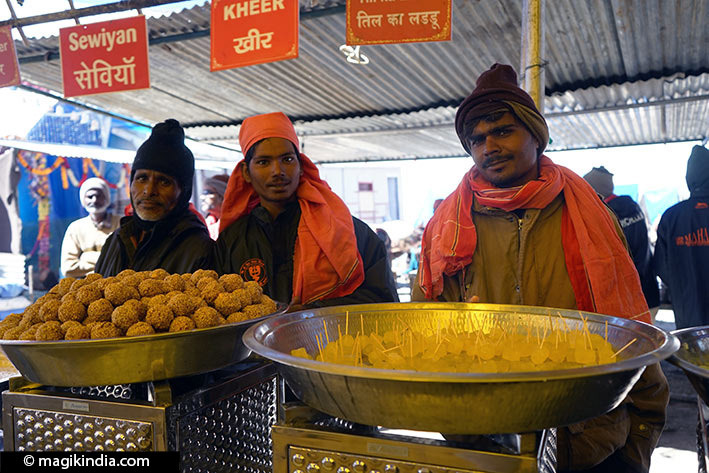 And not any old grub – but 5-Stars food served all along the Yatra. 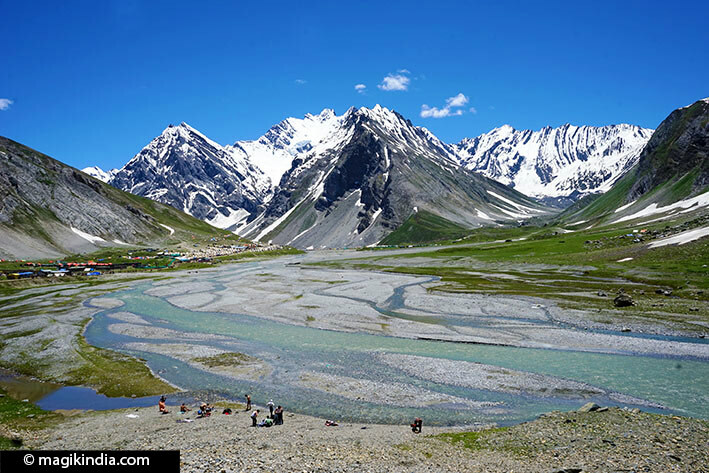 Sheshnag, a mountain with seven peaks, is named after the mythical seven-headed snake. 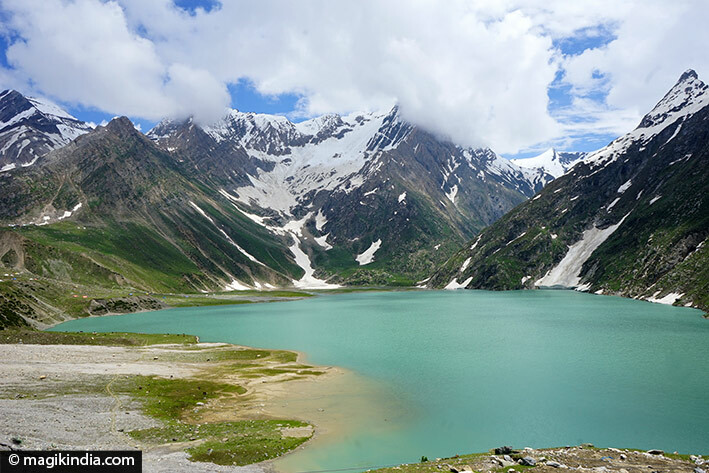 From here you look down on the crystalline blue waters of Lake Sheshnag. 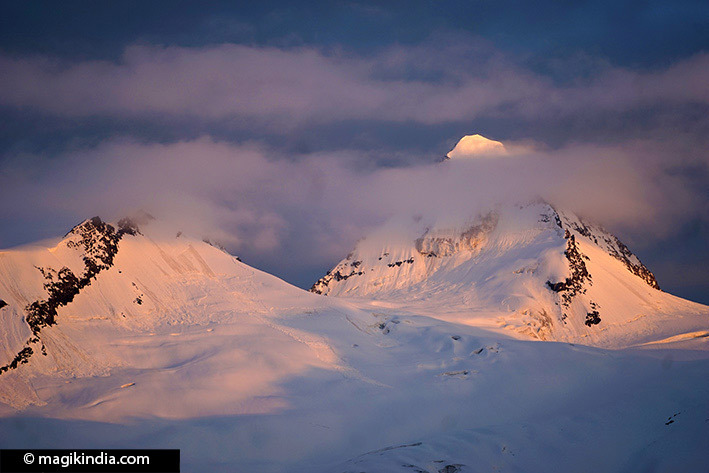 The spectacle of natural beauty as the sun sets behind the mountains will leave you speechless. Its perfection and magnificence are indescribable. The cool and the quiet of the mountain lull you to sleep and at 5am you are up again, set and ready for the long walk from Sheshnag to the holy Amarnath cave and from Amarnath to Baltal – 30km in all. Once again the scenery is superb. And now you meet the snow. After winding around several hills you reach the meadows around Panchtarani base camp, where shepherds graze their sheep surrounded by magnificent glaciers. Here at the foot of Mount Bhairav seven rivers flow; according to legend they flow from Shiva’s locks. It is just 6km from Panchtarani to the sacred cave but it is a steep climb, crowded with pilgrims, and takes several hours. It is also 3600m above sea level; the air is thin and you struggle to get your breath back. Coming round a bend the splendid Lidder Valley appears with the cave on the other side. 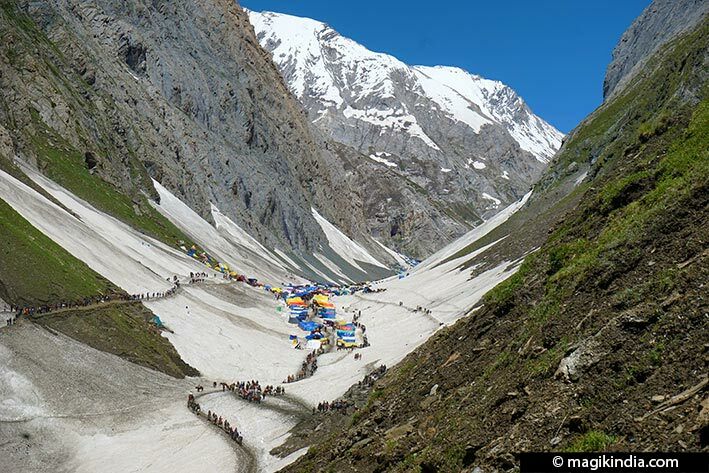 Amarnath is heaving with pilgrims and horses and it is hard to make your way among them. You take a quick dip in the icy waters of the Lidder River and then you’re beneath the cave. The atmosphere is pious, the excitement palpable, and the darshan (sight) of the ice lingam is a solemn moment. A magical experience. Om Namah Shivaya. But you still have the 15km walk to Baltal ahead of you. At first sight it’s not a difficult walk but you’re tired by now and the last few miles, by the light of your headlamp, seem never-ending. Civilisation isn’t far now! The busy, colourful streets of Baltal welcome you at last. 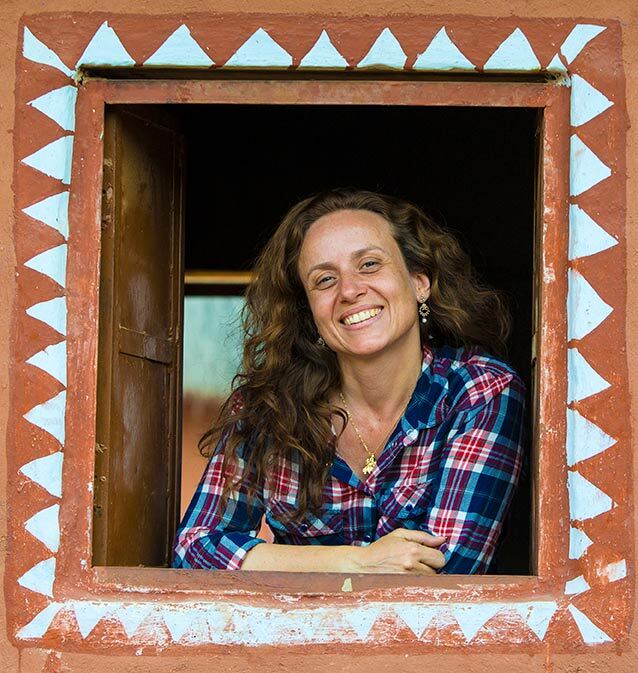 With a smile on your lips and a grateful heart you go over in your mind each stage of the incredible, unique adventure.